Tomorrow, Mike Shanahan will name the starting quarterback of the Washington Redskins. 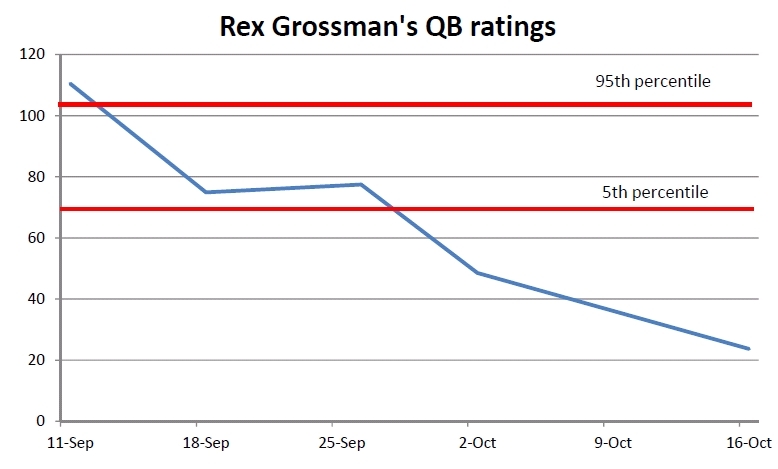 Rex Grossman seems like a nice guy, but I’m not sure he should be a starting quarterback in the NFL. Here are his quarterback ratings over the first five games of the year. Overall, Grossman has the second worst average QB rating in the NFL. Of course, the QB ratings “is a complex. nonsensical formula that combines a QB’s completion percentage, Yard per Pass Attempt, TD Pass Percentage, and Interception Percentage into a single incomphrensible number.” Grossman was ranked third worst with Wayne Winston’s formula and fifth worst with the “wages of win” ranking. But with only five games under his belt, it is possible that a bad couple of games are unfairly weighing down Grossman’s stats, but I wouldn’t bet on it. Who is the best? Aaron Rodgers (much to my dismay as a Bears fan!) Jay Cutler and the Chicago Bears appear to be average this year. This entry was posted on Tuesday, October 18th, 2011 at 8:53 am	and tagged with sports and posted in Uncategorized. You can follow any responses to this entry through the RSS 2.0 feed. Oh sure pour some more salt on the wound with the starting QB controversy of my life long favorite NFL team. But in all seriousness I agree they should bench him and I’m glad someone has empirically proven it. Lots of extraneous factors go into the QB rating: how good the opposing defenses are; how well the offensive line blocks; how well the receivers run routes and catch balls; whether the running game is productive (making ball fakes effective); whether the defense keeps the score close; average starting field position (kicking game). I’m no fan of Grossman, but let’s see how the next guy does. @parubin I agree. The QB rating doesn’t merely rate the QB. QBs with the highest ratings often have the best offensive lines. I noticed that Jay Cutler’s QB rating is in the middle of the pack largely due to poor play calling and a subpar offensive line. I won’t say that he is one of the best in the league, but his QB rating is not something that he can entirely control. @Mark I agree! We don’t really know how other QBs on the same team would rate until they play. However, I would argue that this sheds light on the decision-making process regardless of who the backup is. This shows that the odds are pretty good that it is only uphill from here. Of course, Rex’s backup is certainly below average when compared to other QBs in the league, so I can’t imagine a huge improvement for Washington. @Larry I don’t mean to pour salt on Rex’s wounds. I genuinely root for Rex, since he kept things classy when he was in Chicago. I was thrilled when he was named the starter at the beginning the year. I hoped that “Bad Rex” was a thing of the past. 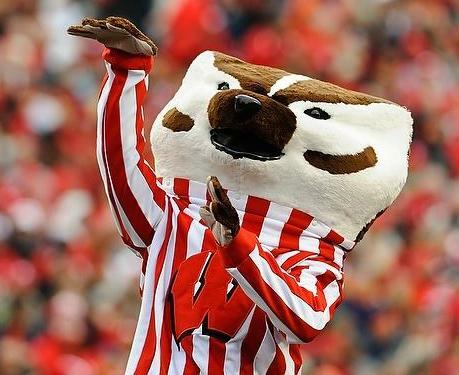 It’s a lot easier to root for him when he isn’t on “my” team.